Midfielder Luke Berry thinks Luton still need to pick up ‘four or five’ wins to make sure of promotion to the Championship this season. 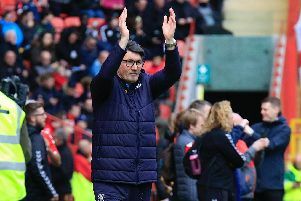 With seven games to go, Luton are five points clear of nearest rivals Barnsley, with Portsmouth in third, nine points back. Sunderland, now in fourth, are 10 points adrift, although they have two matches in hand on the Hatters. Berry said: “I thought about two months ago, six, seven wins were needed, and now we probably need four or five, which is a bit weird as we’ve won pretty much every game. “We just try and take it game by game, as if we get ahead of ourselves, we’ll draw and then we’ll lose. “We’ve got a good bunch of lads and we keep grounded, we work hard every single day, so that’s key. A win at Bristol Rovers on Saturday will see Luton increase the gap to Portsmouth and Sunderland, as the pair battle it out at Wembley for the Checkatrade Trophy. Berry added: “We just do what we can do and control us, if we keep on winning, we know the rewards. “We look at Bristol Rovers, pick up a win and go from there. "We’re 26 games unbeaten, if we’re not confident now, there’s got to be an issue.